Dominion Iron Doors has been in the business of design, fabrication and installation of hand Forged Iron Doors for the past 20 years. We specialize in creating the most beautiful wrought iron doors of the highest quality in the market, providing total satisfaction to our customers. To achieve a beautiful, unique and elegant appearance to a new home or if you're considering changing your existing door, Dominion Iron Doors is the best option. We offer a large number of copyrighted original design options, and our doors come in numerous styles and sizes to fit any home. For maximum quality, Dominion Iron Doors uses only the highest quality in structural steel, solid iron hand forged decorative scrolls and the most advanced technology in insulation, finish and iron door fabrication. Our doors are designed with an interior operable glass panel. It is easy to clean allows ventilation and security for the house. We provide 3/4" insulated and tempered glass panel, the insulated glass is superior in energy efficiency and the tempered glass provides protection to your home. 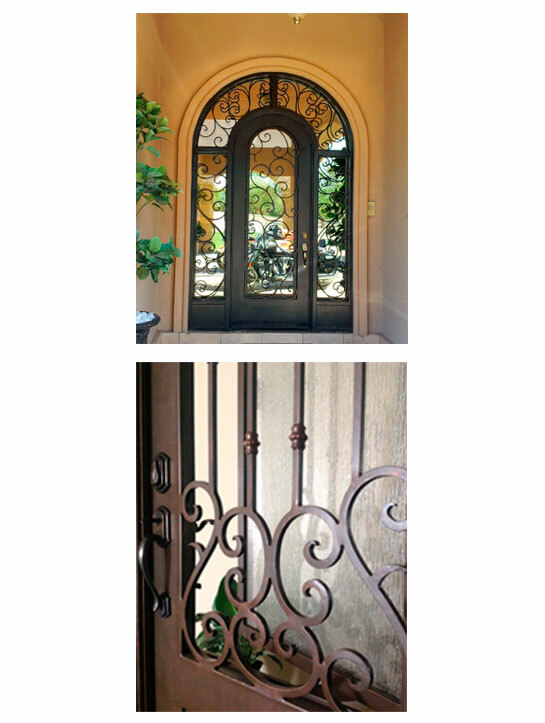 Dominion Iron Doors offers the most elegant and highest quality hand forged iron doors.